When we start to view students not as ‘your students’ or ‘my students’ but as our students, that is where we can start to truly collaborate and transform student learning. She embraced taking an active role in her education—something missing from her prior experiences with science education, which largely consisted of memorizing and repeating facts presented by a teacher. Her experience with research led Shim to enroll in a teacher education course in South Korea. It was there that she was first introduced to the inquiry-based model of learning as a theoretical framework, and during an internship in Washington D.C., Shim saw how the theory could function in a live classroom. “The way that the students were learning science was quite different from the experiences I had in my educational journey as a student,” Shim said. Helping students transition from information receivers into knowledge builders is a core value of the inquiry-based model of learning. Within this framework, Shim said, teachers become facilitators of the knowledge building process rather than sole providers of scientific knowledge. Following her internship, Shim returned to South Korea to earn her master’s in science education. While reading articles on science education research, she discovered the work of Jessica Thompson, Mark Windschitl, and Jennifer Richards at the UW College of Education. Intrigued by their studies on model-based scientific inquiry and teacher education, Shim was inspired to apply to the College’s curriculum and instruction program with a focus on science education. 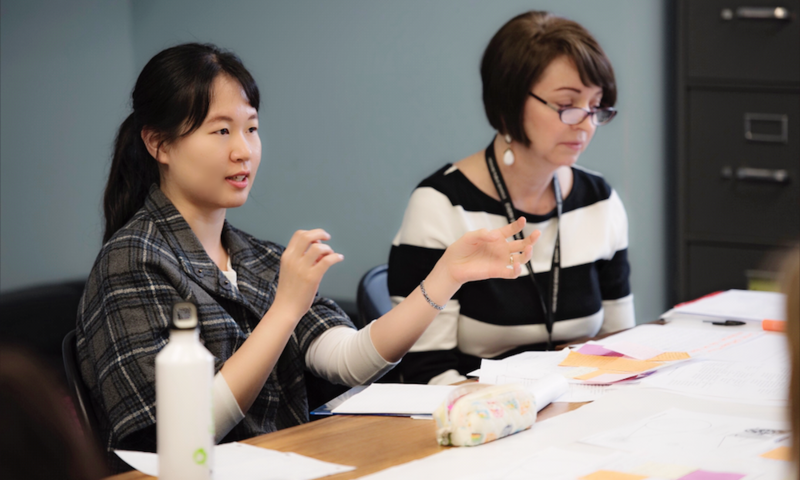 During the first three years of her PhD program, Shim worked with Thompson and Richards on their research in the Highline and Seattle school districts, focusing on growing collaboration among teachers to position their students as knowledge builders in their classrooms. This year, Shim is continuing her work at a high school in the Highline district for her dissertation research, examining the ways that science teachers’ collaborative efforts to improve their teaching in a professional learning community can contribute to providing rich opportunities for diverse students to learn science in meaningful ways. “When we start to view students not as ‘your students’ or ‘my students’ but as our students, that is where we can start to truly collaborate and transform student learning,” Shim said. In the future, Shim plans to continue contributing to science education research by positioning students as active knowledge builders while promoting collaboration among teachers.